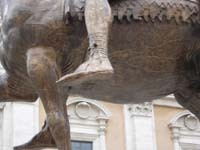 How well did you know Ancient Rome? Check your answers below. 1. 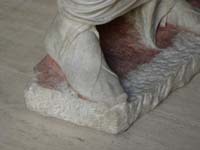 What type of footwear did an ordinary Roman citizen wear with his toga? 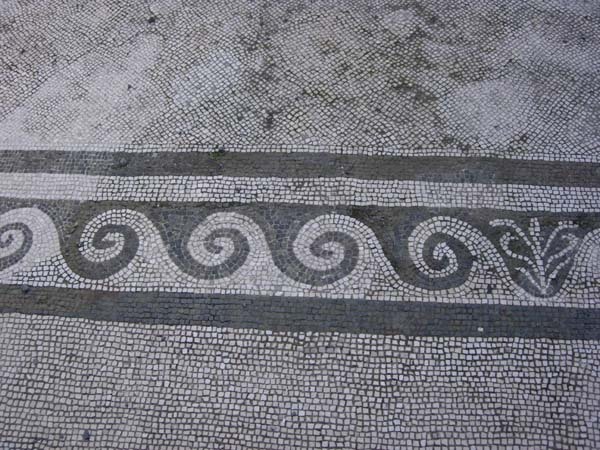 Answer C. When ordinary Roman citizens wore a toga they wore a boot that laced up the front. Sandals were only worn with tunics and never with togas. Roman nobles wore a boot with two sets of leather straps that wrapped around their ankle and tied in the front. These boots were colored red for the patrician class and black for the equestrian/knight class. To show their rank, patricians would use a leather so fine and supple that you could actually see the outlines of their toes through the leather (click on the lower image) causing the modern mistake that they were wearing sandals. 2. The novel Victory's Crossing follows Alexander, a Jew and Roman citizen, during his time in Rome in the Summer of 12 AD. 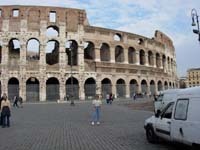 A reader recommended that the book include a scene with gladiators fighting in the Colosseum. To maintain authenticity, the author opted for a chariot race in the Circus Maximus instead. Can you guess why? Answer A. 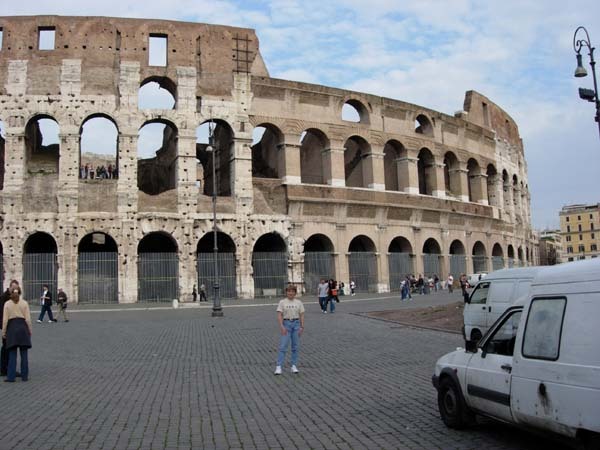 Construction work on the Colosseum did not begin until decades later in 71AD after Vespasian suppressed an uprising in Judea and brought thousands of Jewish slaves back to Rome to do the construction work. 3. 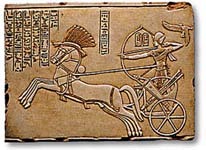 Below are three artistic depictions of charioteers. Which one(s) would you see in a chariot race in the Circus Maximus in first century Rome? Answer B. The image in A. is of the Egyptian pharaoh Ramses. 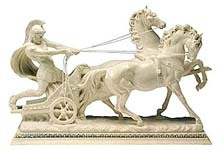 C. is of a military style chariot but Romans had replaced the use of chariots in battle with cavalry decades earlier. Racing charioteers were slaves or poor freedman and never military men (despite modern media). They wore a tunic in their team's colors (green, blue, white, red) and leggings, both wrapped tightly to reduce wind resistance and a round leather helmet. 4. 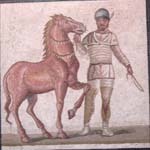 Although the wealthier Romans painted their walls with bright colors like red and gold, floor mosaics were usually made primarily of white marble. Why? Answer A. 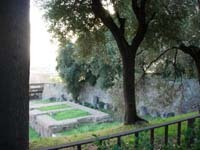 Nights were particularly dark in Rome since the small oil lamps used did not cast much light. 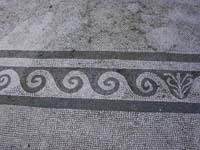 So the Romans used white marble on their mosaic floors because it reflected the moonlight and helped to illuminate the room. Marble was also placed occasionally in the cobblestones of roads and pathways since it would also reflect the moonlight to mark the path in the dark. 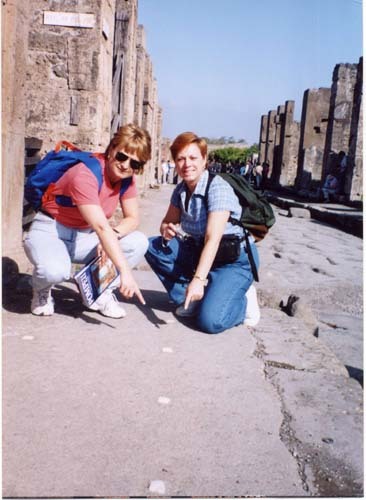 Click on the image on the lower left to see marble embedded in a sidewalk in Pompeii. 5. Both Caesar and Augustus granted Jews in the Roman Empire the legal right to practice their religion exclusively. Jews were not required to make offerings to a Roman god. In the first century a new cult came from the East and tried to adopt the Jewish practice of not worshipping Roman gods but they were punished for breaking the law. Can you name this Eastern cult? Answer B. The followers of Christos, or the Christ, came to Rome in the second half of the first century. Like Jews, the Christians' faith permitted them to worship only one god. However, unlike Jews, Christians had not received the legal right from the Emperor or Senate to refuse to worship the Roman gods. 6. A visitor to Rome could have found a place like this on practically every block. What is it? 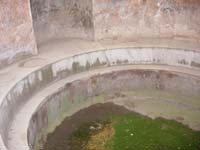 Answer C. Taverns and food shops typically kept their amphora or clay pots of drink and food in these holes. 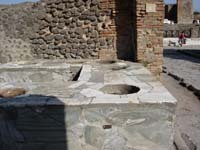 Hot or cold water containers were placed in first and then the pots containing food placed on top -- very similar to modern warming dishes in restaurants. 7. The ancient Roman baths consisted of three separate chambers: a warm water bath, a cold water bath, and a sauna room with hot water. 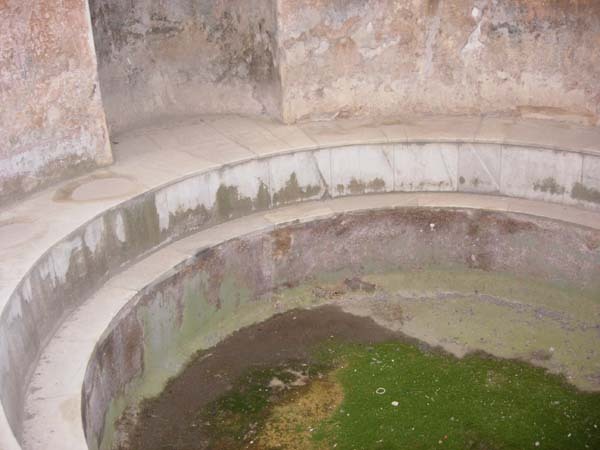 In what order did a bather use each of these chambers? Answer A or C. Sorry. It was a trick question as scholars differ on the exact order of the baths in the face of little literary evidence and contradictory archeological evidence. 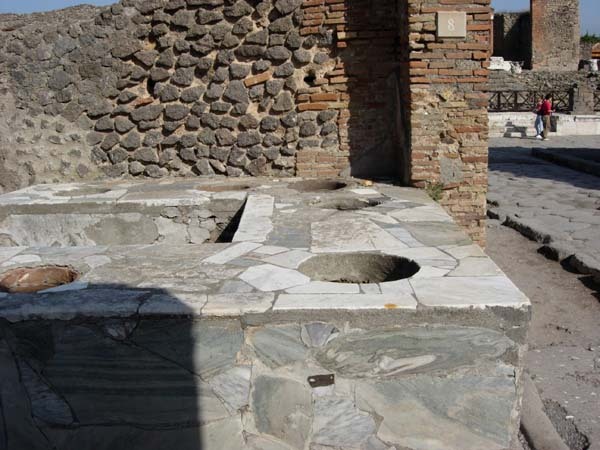 The book Victory's Crossing followed the order of the bath house in Pompeii which had a) a room with cabinets for storing clothes b) the frigidarium or cold water bath c) the warm water batch and d) the tepidarium the sauna where sweat and oil are scraped off. 8. In Victory's Crossing Claudius' older brother Germanicus mentions the impending birth of a new son whom he will name Gaius. Gaius later became Emperor but history better remembers him by what name? Answer D. Germanicus took his young son Gaius with him on military duty. They dressed him up as a soldier and he became the special pet of the legionnaires who fondly nicknamed him "little boot" or Caligula, after the Latin name for a soldier's boot. The Roman Emperor was known as Gaius and not by his childhood nickname.